My squash plants seems to be suffering from squash wilt. Is there any way I can save the plants? The squash, cucumbers, and tomatoes on the vine seem to be growing beautifully, and I would hate to lose my harvest. Is it possible that something else might be turning my squash leaves yellow? We have been getting a ridiculous amount of rain for the season. Also, with the amount of rain we've been getting, I'm wary of using any more water soluble fertilizer in my garden for fear of over watering. Do you think 10 x 10 fertilizer would be too strong to use? Your yellowing leaves could simply be the excess amount of rain you mention. 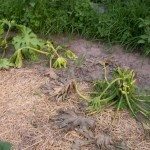 Plants that sit in soggy soil can die from root rot. 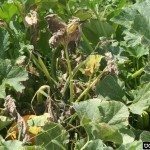 These stressed plants then in turn will be more vulnerable to insects and disease. I would not try to fertilize them into health. Do not fertilize. You could try Epsom Salt. I use this during the hot growing days of summer with quite good results. I'm including some links for you.